Well, this might be the best Japanese town then, no? Starting April 1 (this is no joke! 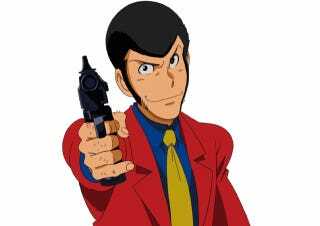 ), the city of Sakura in Chiba, Japan is issuing 3,000 limited edition Lupin the Third motorcycle license plates. According to the city's official site, the image of Lupin is from the first anime series. Lupin the Third's creator Monkey Punch lives in the city, which is marking its sixtieth anniversary. The white license plate is for bikes under 50cc, the yellow plate is for bikes under 90 cc, and the pink plate is for bikes under 125cc. Those with bigger bikes won't get to use Lupin plates. Sorry! However, they are making a blue Lupin plate for microcars. That's awesome. This gentleman is holding a sample. No, it is not to scale. You can apply for the plates starting January 15. If there are too many applicants, the plates will be distributed by raffle.